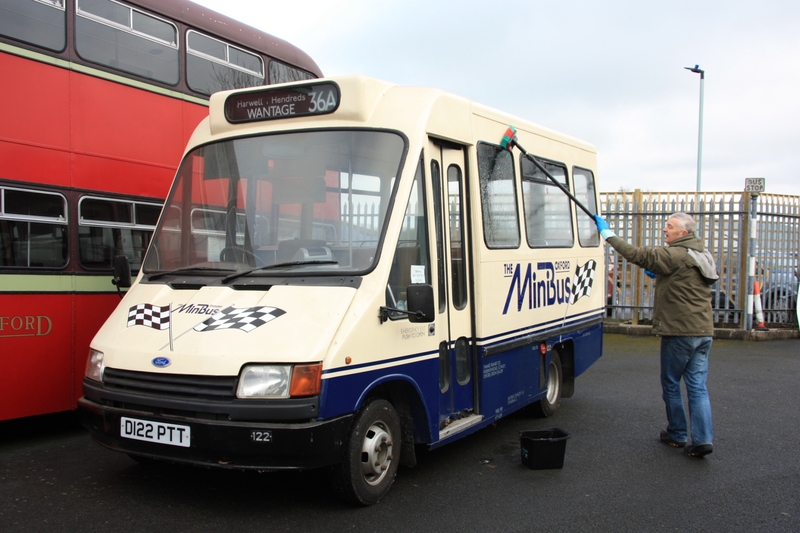 For many years this 1987 Ford Transit 190D has been in the reserve collection of the Oxford Bus Museum at the back of a running shed but has now being cleaned up and put on display in the main museum. It was brought new to Oxford when Harry Blundred started up Thames Transit in competition to The City of Oxford Bus Company. The initial 40 Oxford Minibus 16-seater fleet could carry less than 700 passengers at any one time. Just ten of original Oxford big buses could carry approximately the same number. However, the frequently-appearing minibuses were an effective alternative way to travel, even though it was unlikely they would have ever seriously undermined the established business. The habit or expectation of having very frequent bus services in Oxford today grew out of these new minibus services. Competing by cutting fares, running later at night, overnight, more frequently on Sundays, paying higher wages and starting parallel services were not unique to minibuses. All were used in Oxford plus by the established company threatened to start competing minibus operations in Exeter. The original Oxford company had converted services on Marston Road to Ford Transit minis before the Exeter fleet arrived so had sufficient experience of the potential and the limitations of minibuses. A big attraction of minibuses but not one obvious to passengers was a reduction in engineering costs. Big buses meant big workshops and stocks of specialised bus spares. Truck and bus chassis designs had grown apart over the years. Transit spares were cheaper and plentiful. Dealers could hold parts and issue them on demand, called Impress stock. For many years the bus has been in the museum’s reserve collection but has been cleaned up and put on display in the main museum. There were 40 minibuses put on the road like the one pictured above together with a batch of slightly bigger minibuses for Park and Ride services which ran under the Livery and promotion slogans such as “Catch Gloria; Park and Ride with Gloria Glide.” One is still appropriate today -- “Drive to Oxford and drive yourself Crazy”. The minibuses were never frequent enough nor had enough seats for the Park & Ride services and the service was soon withdrawn. At the same time Harry Blundred started the Oxford Tube service to London in competition with The City of Oxford Bus Company; a service that has survived and is now operated by Stagecoach.